Welcome to the 2009 Archive Page. We will be updating this page in due course! 30th Oct 2009 – 1st International Day of Hope and Remembance for those affected by Hate Crime. 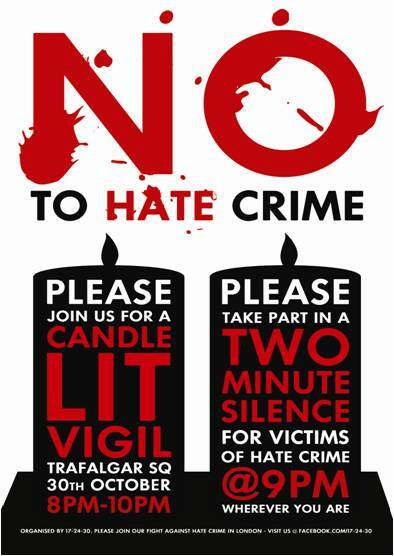 The first Candle-lit Vigil was organised on the 30th October 2009 in Trafalgar Square after the death of Ian Baynham, who died from the injuries he received when he was homophobically abused and attacked outside South Africa House. In the space of two weeks, people from across our communities came together and organised a vigil that was attended by 10,000 people. It was amazing to see so many people standing together to say that hate crime is not acceptable in our communities. 17-24-30 has established this as an annual event, to remember Ian and all those who have been attacked or affected by all forms of hate crime.